I'm on my healthy eating kick still, so as part of the meal deal in the hospital I picked this up instead of crisps. It doesn't look too bad really. 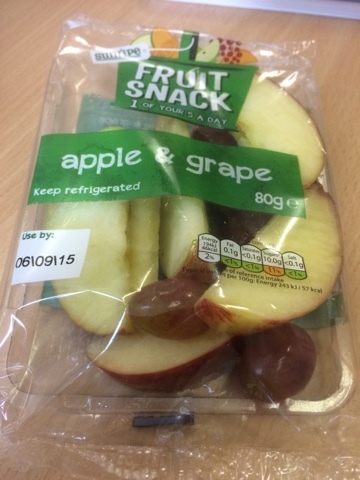 It's 75% apple and 25% grape! What this actually translates to is 6 slices of apple and 5 grapes. For a pound. This feels really mean, even compared to the hospitals own fruit salad boxes for £1.50 you get more than double that. 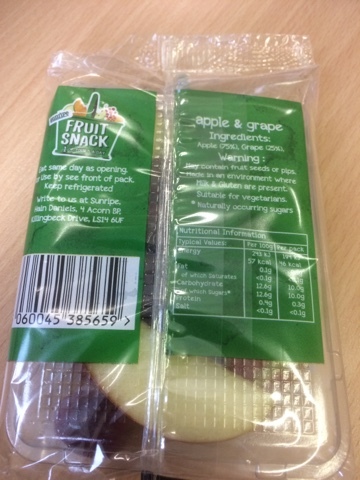 I'm not sure why these healthy snacks that come preprepared are such bad value compared to crisps and chocolate bars - maybe we've just been conditioned to expect different amounts of these things. I can get a decent sized box of blueberries for a pound from Tesco, or a nice salad. I guess the added washing and preparation adds up and the moral here is to take a fruit knife to work and to wash your own!